We at WIT are aiming for a balance in tone between the academic and the personal. So, this is a more personal post, of the “what forms the background for an interest in feminist theology, anyway?” sort. Like much, but not all, that has been posted thus far, it’s fairly Roman Catholic. When I was in first grade, the students at my Catholic parochial school weren’t allowed to wear our Halloween costumes to school (I’m pretty sure I was a unicorn that year. My mother has always been impressively crafty.) — but we were allowed to come in costume on November 1, as long as we dressed up as our patron saint–in my case, Brigid of Kildare. I remember both thinking and really wanting not to think that this was incredibly unfair. There is a beautiful girl. An unvirtuous man wants to marry said beautiful girl. Said beautiful girl has already pledged her virginity to Jesus, and as such refuses to marry said unvirtuous man. or B: Said beautiful girl, through divine intervention, manages to escape marriage, thus fulfilling her life-long dream of becoming a nun. Blandina, through whom Christ showed that things which appear mean and obscure and despicable to men are with God of great glory, through love toward him manifested in power, and not boasting in appearance. For while we all trembled, and her earthly mistress, who was herself also one of the witnesses, feared that on account of the weakness of her body, she would be unable to make bold confession, Blandina was filled with such power as to be delivered and raised above those who were torturing her by turns from morning till evening in every manner, so that they acknowledged that they were conquered, and could do nothing more to her. And they were astonished at her endurance, as her entire body was mangled and broken; and they testified that one of these forms of torture was sufficient to destroy life, not to speak of so many and so great sufferings. Now, the Children’s Book of the Saints story of St. Brigid I had entirely followed this narrative: beautiful girl, Christian slave mother, Important Druid father, started out by following her mother as a servant, was desired by many men, prayed herself ugly to avoid marriage (honestly, this is not the kind of thing that makes sense to a not-particularly-beautiful child…), was therefore permitted to become a nun, and exhibited such impressive purity that she was eventually known as a second Mary in Ireland. So, while my friend at the time George got to dress up in a suit-of-armor and carry around a sword and a toy dragon — which, how cool is that? — first-grade Bridget dressed up as a milkmaid, in a dull brown robe and a basket with a stuffed cow. I’m not entirely certain how I wound up dressed like a milkmaid instead of a nun — presumably, I was going for the “serving girl” portion of Brigid’s life — but there we have it. George got to fight dragons; I got to pray to be ugly. Looking around at St. Anne’s parochial school on November 1, this seemed generally characteristic of the boys’ vs. girls’ costumes. 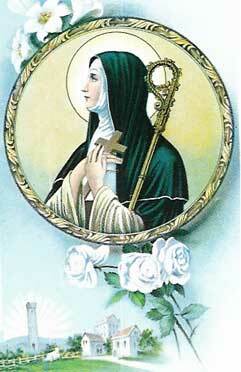 These days, I have a markedly less ambivalently warm regard for female saints. when Christ’s role in the Eucharist is to be expressed sacramentally, there would not be this “natural resemblance” which must exist between Christ and his minister if the role of Christ were not taken by a man: in such a case it would be difficult to see in the minister the image of Christ. For Christ himself was and remains a man. Blandina was suspended on a stake, and exposed to be devoured by the wild beasts who should attack her. And because she appeared as if hanging on a cross, and because of her earnest prayers, she inspired the combatants with great zeal. For they looked on her in her conflict, and beheld with their outward eyes, in the form of their sister, him who was crucified for them, that he might persuade those who believe on him, that every one who suffers for the glory of Christ has fellowship always with the living God. 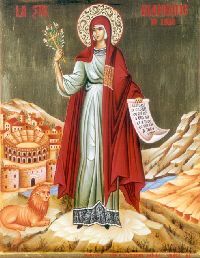 No one could fail to name Mary Magdalene, disciple and first preacher of the resurrection, but I also love the far-more-often forgotten Junia, a prominent apostle, according to Paul, after whom my goddaughter is named. And who can resist a fascination with Perpetua and her visions, even if the contemporary desire to portray Perpetua and Felicity as friends — a desire I well understand, given the deep significance of female friendships in my own life and faith — leads me to ask whether such portrayals perpetuate the sort of false sisterhood womanists, mujeristas, and other women of color have sharply and justifiably criticized in white academic feminism. 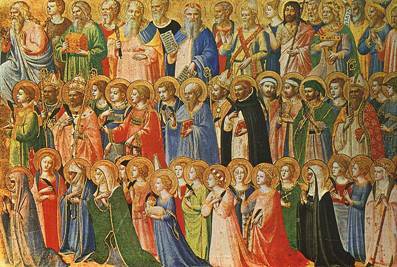 So happy All Saints, everyone — all you holy women and men, pray for us. Update (11/2/2010): For a pop culture presentation of precisely what I’m talking about above that somehow manages to be both hilarious and profoundly moving, see Rebecca Clamp’s “St Wilgefortis,” shared by Megan. Can you please write a Book of Women Saints or something? This post is really powerful and has in a mere 5 minutes prompted me to rethink my understanding of the saints. This is too cool. Too cool. Have you read any of Virginia Burrus’s stuff? I was not raised in the Catholic tradition and was taught that the Saints were all a bunch of made–up stories. 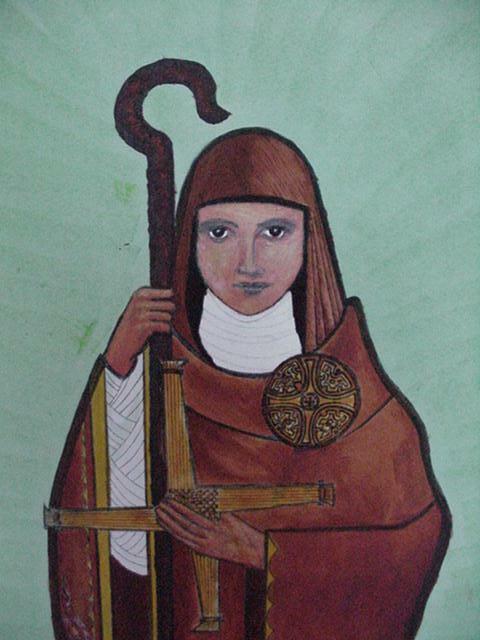 I read Foxe’s “Book of Marytrs”, so I knew of Blandina when I was about 12. Thank you, I loved this post! Hi, Jessica — that’s a really great question. I’m not sure of too many sources off the top of my head. I think I’ve always gotten things piecemeal — but I will definitely think about that and ask around. I haven’t actually read Elizabeth Johnson’s Friends of God and Prophets (“A Feminist Theological Reading of the Communion of Saints”), so I’m not sure how much it touches on particular female saints rather than offering a more overarching and theoretical reflection on the topic, but that might be a place to start. I will give it some thought, though! While I haven’t read this book it comes highly recommended by David Steindl-Rast (www.gratefulness.org). I know that Dorothy Day is included as a contemporary witness for bringing the Gospel to life. All Saints: Daily Reflections on Saints, Prophets, and Witnesses for our Times by Robert Ellsberg. Also, the Holy Women, Holy Men blog (on WordPress) from the Standing Commission on Music and Liturgy (Episcopal) has a collection of commemorations featuring a number of women “saints” remembered in the worship of the Episcopal Church. Inspiring. My patron saint is Patrick. Imagine having to go to school as a “guy bishop” in elementary school. Yes, that’s what I had to do. It was the first time I thought about being ordained. Then, I decided…that’s what I’ll do. I’m going to be a priest. After many letters to the pope (who just sent me holy cards and never answered my questions) I grew up and went to a Divinity School, got my M.Div. and stood in my bishop’s office with diploma in hand and told “HIM” that I really felt the need to fulfill that inner urge to be ordained. He told me that the church didn’t call women…I responded…”But God does. Today 11/8 is the birthday of Dorothy Day (d. 11/29/80). She wrote “Whatever I had read as a child about the saints had thrilled me. I could see the nobility of giving one’s life for the sick, the maimed, the leper… But there was another question in my mind. Why was so much done in remedying the evil instead of avoiding it in the first place? … Where were the saints to try to change the social order, not just to minister to the slaves, but to do away with slavery?” Thank you for this post; it keeps me thinking, and keeps me growing. This was just fantastic. Such a solid contrast to make as well, between Inter Insigniores and Eusebius. And I wouldn’t so quickly give up Bethu Brigte, even as only literary evidence it’s fascinating, thanks for alerting me to it. As a father with two young girls, allow me to echo that a book of women saints after the manner of this post would be a delight.